Most business leaders dread budgeting and forecasting as it falls into the “necessary but painful” work category. So what can we do as business leaders to make it easier? Coming at this topic from the school of hard knocks, there are several steps that can be quickly implemented to improve the process. But, improvement requires marketing and sales department managers to be accountable for budget due diligence, meaningful KPI reporting, and return-on-investment. Here are a few highlights from the recent Enterprise University course I taught on this topic. Why are Budgeting and Forecasting so Difficult for Marketing and Sales? During the course, I focused largely on budget collaboration and financial responsibilities of CFOs versus marketing and sales department managers. Although concepts apply equally to other departments, many CFOs agree that marketing and sales departments are the most demanding, challenging, and impactful when it comes to budgeting and forecasting. Demanding: Responsibilities are broad with many complicated moving parts that must all remain connected not only to customers but to all other company operations. Challenging: Requirements for these departments are constantly changing due to the customer, social, technology, and company matters beyond their control. Critical: These departments power revenue production, a core requirement for company well-being, but with great power comes great responsibility and great influence. How do we get CFOs and Department Managers on the Same Page? In order to solve challenges in budgeting and forecasting, we have to change our expectations of each other’s roles and how we collaborate to accomplish the common goal. As a reminder, the common goal in this blog is to make forecasting and budgeting easier and more valuable for everyone involved. Here are a few of the techniques and tools shared during the course as it would be a shame to wait for Fall Semester to share with a broader audience. 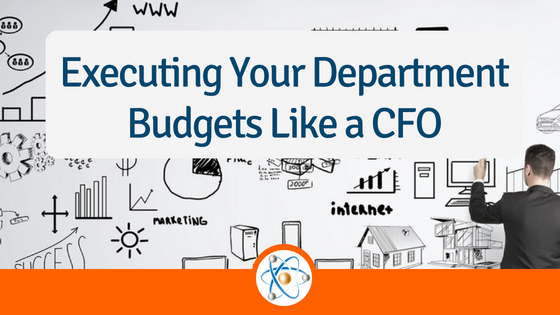 Everyone saves time when CFOs provide department managers with a template for consistent budget formats. The budget template should be easy for the team to use and easy for the CFO to combine into a company-wide budget or financial model. Increased reporting often results in more work without more accuracy because the reports fail to attribute cross-department budgets to Key Performance Indicators (KPIs). Effective KPI reporting fosters budget accuracy with spending aligned to common goals. Budget get out of control when one department fails to care for the implications of change within another department’s budget. This wastes time, reduces accuracy and causes conflict. Download this decision-making framework to encourage evidence-based and collaborative decisions that are good for the budgeting process. In this three-hour course, we had a lot more opportunity to discuss how a culture shift in budgeting responsibility will impact bottom-line business performance by saving time, improving accuracy, and fostering financial collaboration. The most important takeaway from the course is that marketing and sales departments have great power, and with that power comes great responsibility. However, most companies are holding that repsonsibility at the CFO level versus pushing it down to where it belongs. Companies must teach and empower thier marketing and sales department managers to think more like CFOs, be accountable for profitability like a CFO, and make evidence-based decisions.